Leveraging on our vast industry experience of manufacturing, exporting, and supplying a wide array of Oil Spray Systems we are presenting Oil Spray Systems For Oven Chains In A Food Factory. These systems are designed and developed as an oil lubrication system to feed Rotalube applicators that are installed inside an oven. We have in our store quality Oil Spray machine [For Salty Biscuits]. 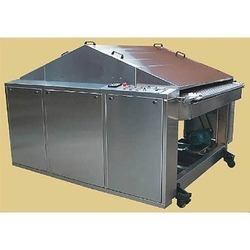 This machine is specifically used to spray edible oil on the top and bottom of hot biscuits in an appropriate manner. Oil is sprayed to the biscuits that immediately comes out of oven before being transferred to cooling conveyor. Keeping all the quality norms in mind, we are known for offering an extensive range of Biscuit Oil Spray Machine. This Biscuit Oil Spray Machine makes biscuits tasty by enhancing their flavor. The amount of oil is sprayed as per the product standard and keeps biscuits look fresh and attractive. Oil-spraying finished biscuits are cooled through transmission. The automatic Oil Spray Machines are manufactured using the Snax Biscuit and Fermented Biscuit it made of fully stainless steel and is geared with motor. 1)Oil tank capacity:- 10 to 200 ltr. The machine is required to apply a thin layer of edible oil on both sides of biscuits for polishing of cracker biscuits. The Oil Spray Machine is used to spray fine most of edible oil on the top and bottom of hot biscuits coming out of oven before being transferred to cooling conveyor. We bring forth highly advanced Oil Spray Machine for our valued customers. Oil Spray Machine is highly sought after owing its characteristics such as high performance, reliable nature, durability, and accuracy. With ergonomic design of Oil Spray Machine, it is easy to use as well as maintain. Oil spray unit is only used in the production of fermented dough, Snacks variety biscuits. It sprays required quantity of food quality oil over the baked fermented dough biscuits. The oil spray machine is used to spray fine mist of edible oil on the top & bottom of hot biscuits coming out of oven before being transferred to cooling conveyor. Stainless steel wire mesh for conveying the biscuits. Speed control through AC frequency drive (optional). Machine fitted on four castor wheels for pushing out of the line, when not required. Top and bottom spray through nozzles / splitting discs / wire brushes (Optional). Oil consumption adjustable between 5% to 10%.